The cGMP kit is designed for the accurate quantitative measurement of Cyclic GMP, a major second messenger that mediates various cell activities. The cGMP assay kit accurately measures Cyclic GMP produced by cells. The assay can be used to screen molecules that modulate the Phosphodiesterase (PDE) activity. cGMP is a major second messenger that mediates cell activities by activating various protein effectors. Cellular cGMP is synthesized by soluble guanylyl cyclases and particulate guanylyl cyclase, triggered by nitric oxide and atrial natriuretic peptide (ANP) binding respectively. 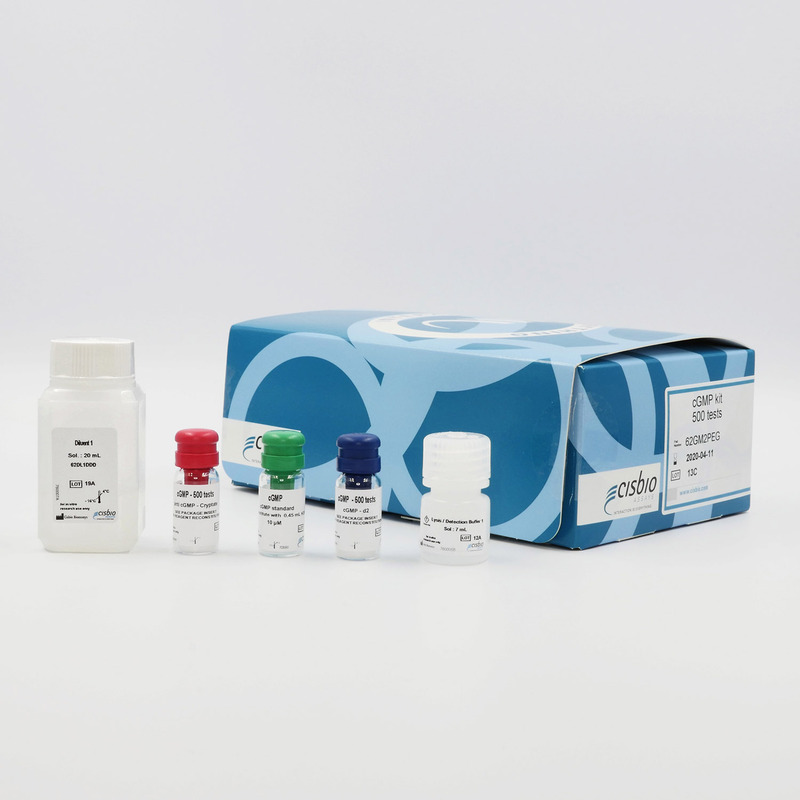 The cGMP kit offers superior benefits over traditional ELISA readouts with the ease-of-use and high sensitivity of homogeneous TR-FRET assays. The kit is based on a competitive format involving a specific antibody labelled with Cryptate (donor) and cGMP coupled to d2 (acceptor). cGMP produced by cells competes with d2-labelled cGMP for binding to monoclonal anti-cGMP Eu Cryptate. - cGMP detection using HTRF reagents. This protocol requires only a single, one-hour incubation period following cell stimulation. The cGMP assay is extremely sensitive and has a wide working range (0.5 - 500 nM), giving the flexibility to use a wide range of cells per well. Figure 1 shows the results of assays performed using 300 and 20,000 cells per well and stimulated with S-nitroso-N-acetylpenicil amines (SNAP), a direct activator of soluble Guanylate Cyclase (GC) enzyme. Statistically significant quantities of cGMP were detected from as few as 300 cells. A typical dose response curve is shown in Figure 2 for cells stimulated with Atrial Natriuretic Peptide (ANP), a direct activator of particulate GC. Figure 1: 300 to 20,000 RFL-6 rat lung fibroblasts were plated per well in a low volume 384-well microplate. Cells were incubated either in the presence or absence of SNAP and cGMP, quantified using the HTRF cGMP kit following the standard assay protocol. Figure 2: 10,000 RFL-6 rat lung fibroblasts were plated per well in a low volume 384-well microplate and stimulated with increasing concentrations of ANP. cGMP levels were calculated using the HTRF cGMP kit, following the standard assay protocol. IBMX (3-Isobutyl-1-Methylxanthine) is a non-selective inhibitor and Rolipram is a selective inhibitor of PDE4. The PDE4 concentration is 5 ng/ml and cAMP substrate is used at a final concentration of 44 nM.